Senator John McCain said Sunday that he wants President Trump to offer proof for his wiretapping claims. WASHINGTON (AP) — The House intelligence committee is asking the Trump administration for evidence that the phones at Trump Tower were tapped during the campaign as its namesake has charged, a request reinforced Sunday by an influential Republican senator who says the president must either come up with the evidence or retract his claim. 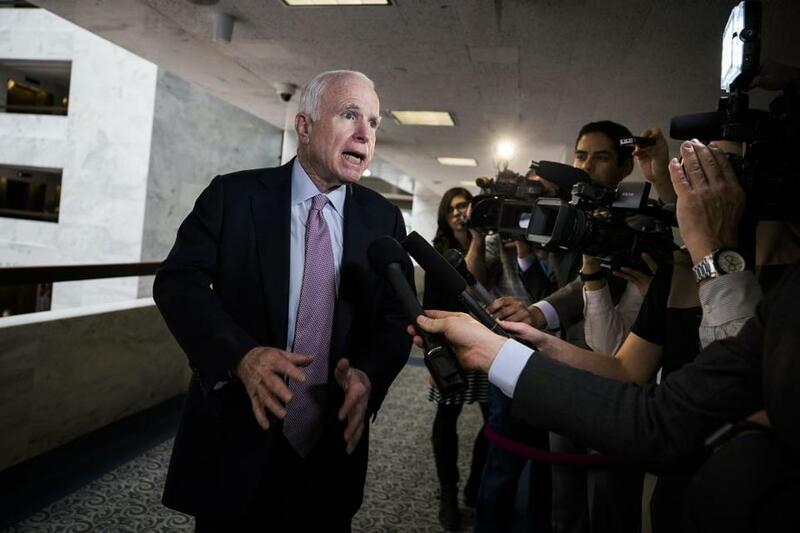 ‘‘I think the president has one of two choices: either retract or to provide the information that the American people deserve, because, if his predecessor violated the law, President Obama violated the law, we have got a serious issue here, to say the least,’’ Sen. John McCain said. ‘‘The president is a neophyte to politics — he’s been doing this a little over a year,’’ Nunes told reporters this past week. Declaring that Congress ‘‘must get to the bottom’’ of Trump’s claim, Sens. Lindsey Graham, R-S.C., and Sheldon Whitehouse, D-R.I., asked Comey and Acting Deputy Attorney General Dana Boente to produce the paper trail created when the Justice Department’s criminal division secures warrants for wiretaps.